This artist's concept illustrates an imminent planetary collision around a pair of double stars. NASA's Spitzer Space Telescope found evidence that such collisions could be common around a certain type of tight double star system, making it tough for any life to evolve. 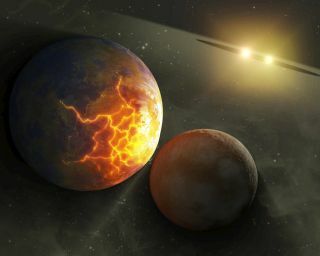 Tightdouble-star systems with the dusty remains of huge planet collisionsmay not bethe best places to look for extraterrestrial life, a new study hasfound. "Thisis real-life science fiction," said study leader Jeremy Drake of theHarvard-Smithsonian Center for Astrophysics. "Our data tell us thatplanets in these systems might not be so lucky ? collisions could becommon.It?s theoretically possible that habitableplanets could exist around these types of stars, so if therehappened to beany life there, it could be doomed." Theparticular class of double stars in the study is about as snug as starscanget. Thestars, called RS Canum Venaticorums or RS CVns for short, are separatedby just2 million miles (3.2 million km), or 2 percent of the distance betweenEarthand our sun. The stellar pairs orbit each other every fewdays, with one faceon each star perpetually locked and pointed toward the other. Forcomparison, the Earth and sun are usually about 93 million miles (150millionkm) apart. Theclose-knit stars are similar to the sun in size and are probably abouta fewbillion years old ?roughly the age ofour sun when life first evolved on Earth. But these stars spin muchfaster,and, as a result, have powerful magnetic fields. The magnetic activitydrivesstrong stellar winds ? gale-force versions of the solarwind ? that slow the stars down, pulling them closer togetherover time.And this is where the planetary chaos may begin. Asthe stars cozy up to each other, their gravitational influences change,andthis could cause disturbances to planetary bodies orbiting both stars. Cometsand any planets that may exist in the systems would start jostlingabout andbanging into each other, sometimes in powerful collisions. Thesecollisions could include any planets in the double stars' habitablezone, aregion where temperatures would allow liquidwater to exist. Though no habitable planets have beendiscovered around anystars beyond our sun at this point in time, tight double-star systemsare knownto host planets. "Thesekinds of systems paint a picture of the late stages in the lives ofplanetarysystems," said Marc Kuchner, a co-author from NASA Goddard Space FlightCenter. "And it's a future that's messy and violent." Spitzerspotted the infrared glow of hot dusty disks, about the temperature ofmoltenlava, around three such tight binary systems. In addition, researchersusingSpitzer recently found a warm disk of debris around another star thatturnedout to be a tight binary system. Theresearchers say that dust normally would have dissipated and blown awayfromthe stars by this mature stage in their lives. They conclude thatsomething ?most likely planetary collisions ? must therefore be kicking up thefresh dust.In addition, because dusty disks have now been found around four, olderbinarysystems, the scientists know that the observations are not a fluke:somethingchaotic is very likely going on. Thestudy is detailed in the Aug. 19 edition of the Astrophysical JournalLetters.